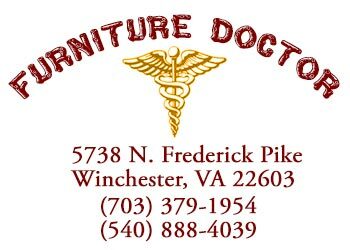 Antique Restoration - Furniture Doctor. All phases of furniture repair including wood lathe turning, duplication of missing parts, and carving as needed, cleaning and waxing. While hand stripping is preferred to retain integrity, I also offer tank stripping for painted pieces if needed. No matter what material the seat and or back has, I can replace it. As always, there is a quick turnaround time, with the exception of French caning which I call a "frame of mind job" because it takes just a bit longer. I offer a wide choice of top quality fabric. My warranty also covers springs and frame work. Repair, stain or paint rattan, woven wicker or recane the seats. I offer the latest selection of fabrics for any style and I replace the foam and re-glue if needed. I offer all styles including trestle, drop leaf, or custom - in cherry wood, oak, walnut, maple or pine. I offer insurance estimates for damaged furniture due to water, fire or while being moved. After your moving disaster you will need all those nicks and scratches repaired to the original condition as well as undetectable. With the cost of new kitchen cabinets, it's easy to see why people choose to have their cabinets restored instead of replaced. I refinish or reface them to match the current color or create custom colors.